Two combines work late to cut wheat in a field on the wide open plains. The latest government snapshot shows the Kansas growers have harvested most of their winter wheat crops. 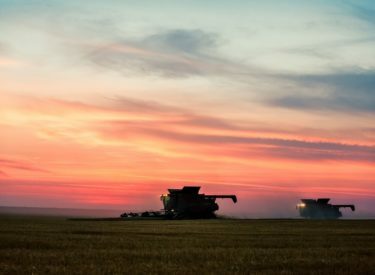 The National Agricultural Statistics Service reported Monday that the Kansas wheat harvest was 71 percent complete. That is ahead of the five-year average. About 97 percent of the state’s wheat left in the field is now mature. The agency also says about 15 percent of the corn in Kansas is in poor to very poor shape with 32 percent rated as fair, 47 percent as good and 7 percent as excellent. Other Kansas crops are also making progress. About 97 percent of the soybeans planted have now emerged and about 20 percent of them are blooming. About 5 percent of the sorghum in the state has now headed.